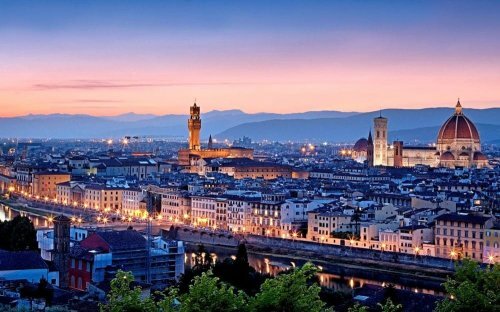 Welcome, this tour will make you discover Florence, one of the most spectacular Italian art cities to visit in any season of the year. 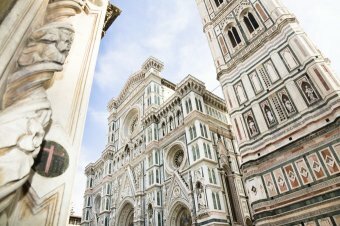 Known as “the cradle of the Renaissance,” Florence is a veritable open-air museum. Its monuments and most important buildings are all within reach of pleasant walks. 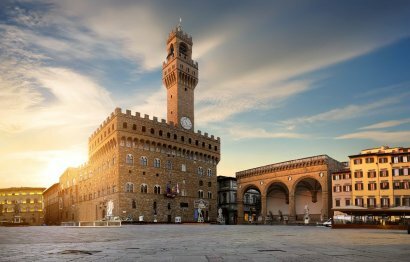 After the visit of Florence, we dedicate ourselves to shopping, the tour will take you to visit The Mall Outlet, a luxury outlet center designed to offer the visitor products of the most prestigious brands at extremely advantageous prices. Immersed in the idyllic Tuscan countryside, in an elegant and refined architectural space. You will do good business! Florence has a historic center visible by walking, travel by car is very low for this reason the tuor begins at the Cathedral of Florence (Duomo di Firenze) where you will be left in total freedom to visit the city by your own, we recommend this itinerary to visit the major symbols of this fascinating Renaissance city. You will be left at the Cathedral of Florence heart and symbol of the city by its side you can admire and visit Giotto’s Bell Tower (Campanile di Giotto) and the Baptistery of San Giovanni, erected in honor of San Giovanni, patron of the city, the Florentine Baptistery stands in front of the large façade of the Cathedral of Florence, in the homonymous square, and represents part of the original religious nucleus of Florence. After visiting these three monuments, all close to each other, you can move south and reach Signoria Square (Piazza della Signoria), the most famous square in Florence, where is the fourteenth century Palazzo Vecchio, seat of the city’s civil and administrative power and the ancient sculptures in marble or pietra serena, like that of the Marzocco of Donatello, or the Fountain of Neptune, the city’s first public fountain. 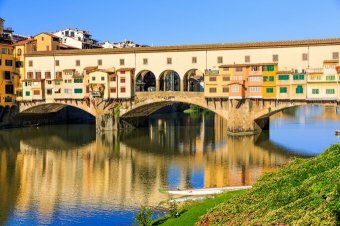 Carrying on south you arrive at the Vecchio Bridge (Ponte Vecchio), known for its international fame, is one of the symbols of historic Florence. A particularity of the bridge are the artisan shops, once butcher shops, today refined goldsmith shops, which are located along the road but are interrupted at the center of the bridge to form two large panoramic terraces. Continuing the recommended route you arrive at the collection point where the driver is waiting for you at 14:00; in Piazza di Santa Croce to visit the Basilica of Santa Croce in Florence where the remains of great artists, writers and scientists are kept inside: Foscolo, Rossini, Machiavelli, Galileo, Michelangelo, to name a few. You will be delighted by the chapels decorated by Giotto, as well as rediscovering the works by Cimabue, Canova and dei della Robbia. Before leaving Florence to go to the Outlet Mall, the driver will take you to one of the most charming places in Florence, “Piazzale Michelangelo” huge panoramic terrace from which to enjoy a spectacular view of the city, dedicated to the Renaissance sculptor celebrated with a copy of one of his works, the David, placed at the center of the square, was built when Florence became the capital of Italy. The Mall is the luxury outlet with incredible prices, in the heart of the Tuscan countryside. 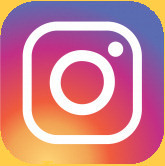 The Mall outlet centre is the ideal destination for those who love fashion and style. An open, next-generation luxury outlet, filled with light and set in the heart of the Tuscan countryside, where you can find the world’s most exclusive brands.THE BRANDS: ALBERTA FERRETTI, ALEXANDER McQUEEN, AQUAZZURA, ARMANI JEANS, BALENCIAGA, BILLIONAIRE, BOTTEGA VENETA, BRIONI, BURBERRY, CHOPARD, CHRISTOPHER KANE, COACH, CORNELIANI, DOLCE&GABBANA, EMILIO PUCCI, ERMANNO SCERVINO, ERMENEGILDO ZEGNA, ETRO, FAY, FENDI, GIORGIO ARMANI, GIVENCHY, GUCCI, HOGAN, JIMMY CHOO, LANVIN, LORO PIANA, McQ, MOSCHINO, PHILIPP PLEIN, POMELLATO, ROBERTO CAVALLI, SAINT LAURENT, SALVATORE FERRAGAMO, SERGIO ROSSI, STELLA McCARTNEY, SUTOR MANTELLASSI, TAG HEUER, TOD’S, TOM FORD, VALENTINO, VERSACE, VERSACE.